Andi B. Goode: Would you like space fries with that? As I mentioned in my last post, I went to Supanova over the weekend and that I'd be blogging about my costumes as soon as it was all over. So here is a look at my costume for Saturday (I only ended up wearing one and not the other as I didn't feel well on the Sunday). Roswell is one of my all-time favourite TV shows so I decided to do Liz’s Crashdown Cafe uniform - it's actually been on my 'costume ideas' list for quite a while now. I was pleasantly surprised at the number of people who not only recognised my costume but were pretty excited to see it, too! One lady said she hadn’t seen a Roswell reference in years and thanked me. It was pretty neat to be able to connect to people over a favourite TV show, especially one that doesn't get as much love as others that aired at around the same time. My mother and I put quite a bit of work into this costume and I’m really happy with how it turned out (though I'll be looking for a taller bopper headband for next time I wear this). 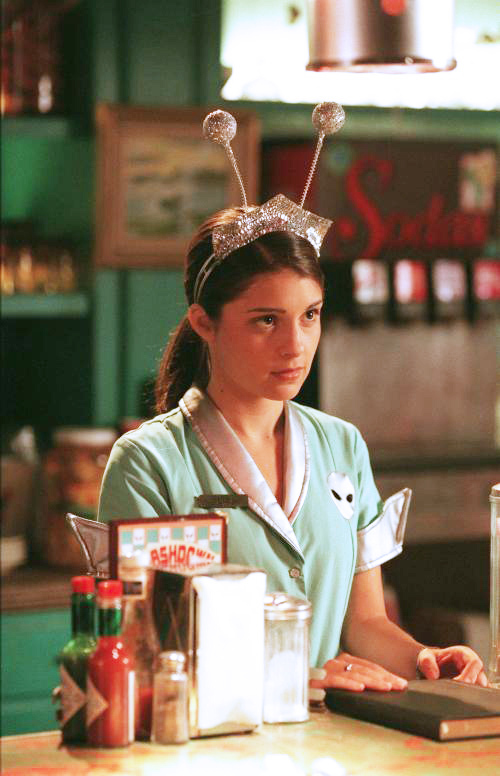 For anyone who hasn't seen Roswell I've included a shot of Shiri Appleby as Liz Parker in her Crashdown Cafe uniform below (though it doesn't show the apron, unfortunately). And here are a small number of photos I actually managed to take whilst at Supanova. This signed photo of Dean Cain made me feel nostalgic for watching Lois and Clark with my mum when it was on TV. I haven't watched it in years - I wonder how it holds up? I don't know this girl but she was dressed as Gaz from Invader Zim! My friends and I used to be somewhat obsessed with this show as teenagers and Gaz was always a favourite character of mine. My friend Abi as Princess Aurora. My friend Shea as Buffy the cheerleader (from the episode Witch). And James Marsters!!! His panel was incredibly entertaining - it was the only panel I went to on Saturday but I'm glad I chose this one. I think I went a bit overboard with the editing on some of these photos - oops! I didn't realise until after I'd uploaded them all but hopefully they still look OK...I'll try to get the second post done soon. My outfit was more vintage inspired (& therefore more relevant to why I started this blog) than this one. Eeeeeeepppp!!! Too cool for words! I adore this costume and have to echo the women who comment about having not thought/seen anything to do with show Roswell in years. I'd say the same applies here, and am suddenly remembering just how much I used to enjoy that show. wish i could've gone! it sounded more exciting than i thought it would be. I saw a pic of your costume on instagram or facebook earlier and fell in love with it. You and your mum did a great job creating it! And you look adorable in it, too. What fun! I've never seen Roswell but looks like your costume was spot on. Your apron is so neat. Looking forward to seeing more! Wow! Your outfit is amazing Andi! So true to the one in the show! It turned out sooo awesome! You really nailed it, down to every detail. Plus it's super cute! Wow James Marsters !! I've dreamed so much met him one day ! I'm a huge Buffy Fan since so long ! I really love you're cosplay too... Thanks for sharing. I think this is my favourite costume ever! I love Roswell so much and end up marathoning it once a year. It's so sweet and cheesy and delightfully fun and adorable and your costume is absolutely perfect! This is so incredible!!!!!! HAHA. I love it! OMG! This is stellar! Fabulous job!! Crazy, I saw James Marsters at Calgary comic-com earlier this year! As well as Adam West, Patrick Stewart, and Stan Lee! It was so much fun! I love your Liz outfit!!! It's one of my all time favorite shows !!! and you got to see James Marsters that's beyond awesome! I found you along the way and will be totally blog stalking now! I <3 the show, and I wanted to wear her uniform, but I couldn't find it anywhere. How did you make it? We used the collar from another dress pattern I have already. A lot of it was guess work, really. I freehanded the pattern for the apron. Sorry that's not very helpful! Can you please tell me how you made your apron? Are the eyes pockets? I have been wanting to make this costume for years and now I am finally doing it. Hi, I basically just free-handed the pattern for the apron (it's actually too long) on some interfacing and cut out a front and back. The eyes were cut out and hemmed and the pockets are joined on the back of the front piece. I didn't sew it myself so it's hard to explain but I think I cut out the same shape as the front (but with bigger eyeholes) from interfacing to which I attached the black fabric of the pocket and the sewed it between the front and back. I hope that helps a little but I'm really not a very good seamstress so explaining it is a bit hard.